This savory side dish goes well with a wide range of dishes. It is forgiving if you leave it in the oven for a bit too long and has a delightful flavor that is surprisingly bright given the cooking method. 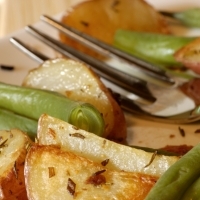 If you don't like green beans, omit them -- the potatoes are plenty good on their own. Wash the potatoes. Cut them into fourths (if small) or eighths (if larger). 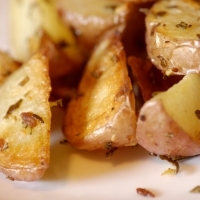 On a baking sheet, combine the potatoes, garlic, and rosemary. Pour the oil over the sheet and mix and stir with a spatula until everything is well combined and coated. Put the sheet in the oven and roast, taking out every 10 minutes to stir and un-stick the potatoes. Roast them until they are nicely browned and caramelized and the interiors are very soft. The time will vary widely depending on the size of the potatoes pieces, but is usually about 35 minutes. While the potatoes are cooking, cut the green beans into 2-inch pieces. When the potatoes are almost done, steam the green beans until bright green and nicely cooked, about six minutes. 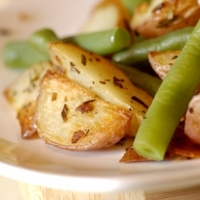 When all ingredients are done cooking, combine the potatoes and green beans. Serve immediately. This is definitely one I will make. Thank you. Thanks. You seem to be sharing the type of recipes I will be sure to make. 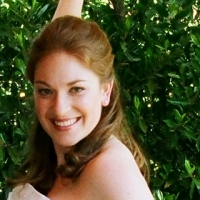 Like staceyfish's recipes? Never miss an upload!